Warm roast vegetables tossed with rocket leaves and creamy cannellini beans make this a filling and tasty lunchtime snack. Preheat the oven to 200°C, gas mark 6. 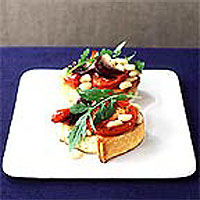 Place the red onion, pepper and tomatoes in a large roasting tin. Drizzle with the olive oil and 2 tablespoons cold water, season and roast for 25-30 minutes, or until softened and golden. Add the beans, rocket and lemon juice and toss well together. Season to taste. Toast the bread and rub the cut side of the garlic over one side of the warm toast. Pile the warm bean salad on top and serve immediately. For extra garlic flavour, roast a few unpeeled cloves with the vegetables. Then crush and mix with the beans.